Here at American Office Services, Inc., years of combined industry experience has assisted us in understanding your upholstered auditorium seating needs and perfect a cost-effective solution: quality reupholstering, restoration, repair and refinishing. We utilize specialized equipment, a unique reupholstering and refinishing process, and countless other ways to provide upholstered auditorium seat restoration of the highest quality, convenience and affordability. 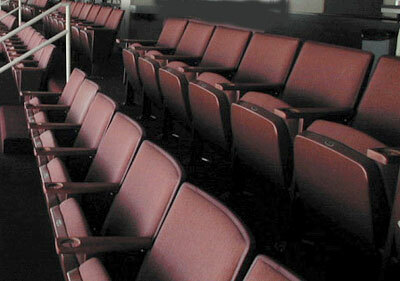 The unparalleled appearance, comfort and durability of your refurbished auditorium seats makes them almost like new. 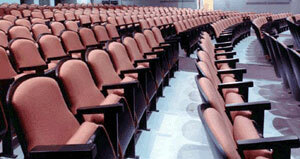 Do You Have An Agenda For The Continued Quality Existence Of Your Auditorium Seats? We recognize the maintenance needs of auditorium seats over their lifetime especially when taking into consideration today’s heavy usage. Studies have shown that the average multiplex theater seat will last up to four years. So we not only provide the best seat restoration in the industry, but also a program that services your auditorium seats every step of the way. Auditorium seat restoration (reupholstering and refinishing) will either take place within your auditorium or off site at our factory. We have a wide range of fabrics, metal finishes and foam packages for you to choose from. Firstly, all of the upholstered inserts are removed from the metal or plastic frames. Then all the fabric is stripped from those inserts. If desired, we can also electrostatically refinish or powder coat all metal parts and refinish your wood armrests or make new arm rests. Meanwhile, new foam and fabric are being installed to the inserts. The entire seat is then reassembled. With our process, there is virtually no downtime and minimal interruption to scheduled events you may have during the time of our restoration process.